The touchscreen version of the EMPowered Smart Lock. 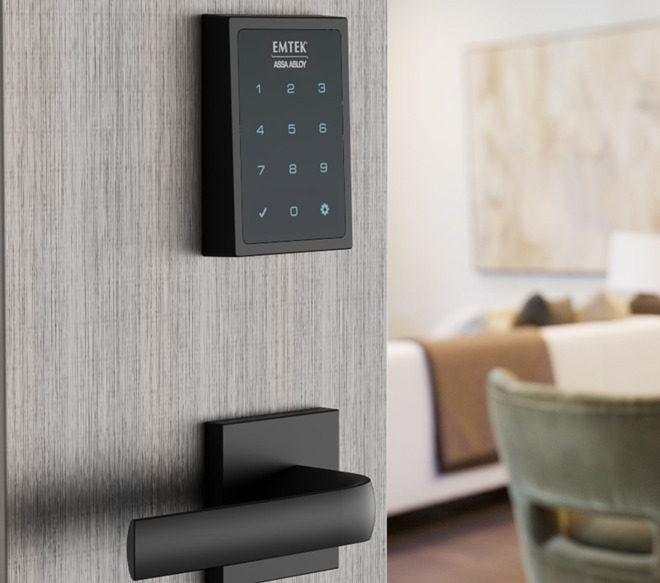 The EMPowered Smart Lock sports an Emtek design, but August's app and cloud services. Two versions will be available: a $370 keyed entryset model, and a $440 edition with a touchscreen keypad, making it possible to open without a key or smartphone. The Assure Lever Lock is meant exclusively for single-hole doors, and unlike other Assure options doesn't replace a deadbolt. It can be used with or without smarthome functions since all models come with physical or touchscreen keypads. Prices range between $149 and $299 depending not just on the keypad type, but whether users want a smarthome module. The Lever Lock with a touchscreen. 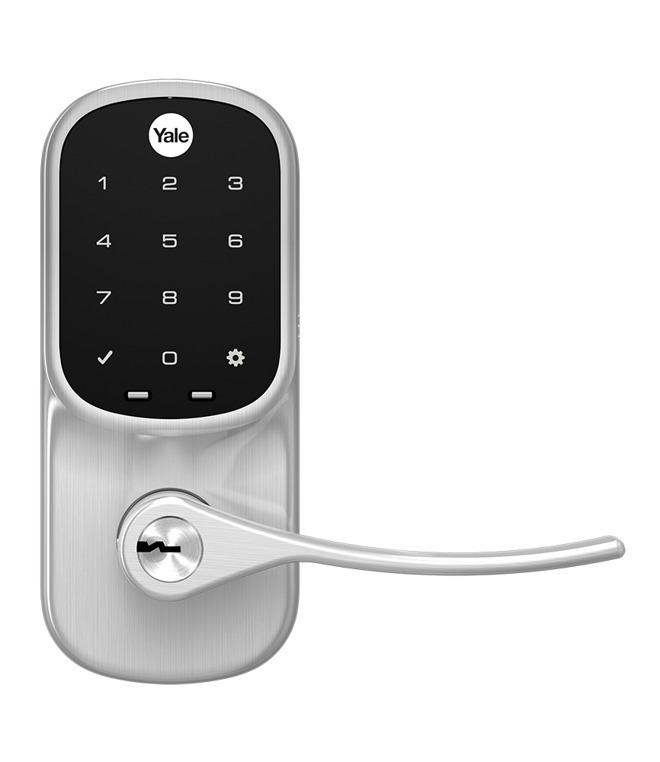 Still waiting for someone to come out with a smart lock that is not ugly. A smart-door lock on my smart home is where I've drawn a line for now. Just not confident in that one quite yet. My cleaner has a key. My immediate family has keys. No one else has a need to be in my home if I'm not there, and the extensive hard-wired and independently powered security system I have lets me know if a door or window isn't secured. TBH I'm surprised when folks I know say they plan to get a smart door lock unless they're showing the house for sale or rent. That one I can understand. The August Smart Lock Pro + Connect I have has been solid. It's not necessary, strictly speaking, but it's convenient for automatically locking and unlocking whenever I leave or return, especially if I'm carrying something heavy. I have no doubt they're generally reliable automatic lock openers and closers. Generally. My wife's car automatically detects when she leaves the vehicle proximity and locks itself, but every once in awhile albeit very rarely, it doesn't. She's so comfortable with it working as designed she doesn't bother to verify. I on the other hand will often check her drivers door at night when I take the dog out. Generally always locked. Generally... and "generally" isn't good enough for me to be comfortable in set-and-forget on something so important barring some special need that outweighs it. I may invest in one someday but not ready yet. I absolutely love it! Sure I have a key on my car keys, but it's so nice especially when it's cold, to pull into the driveway, check my phone, see if the door is locked and if so, unlock it. Plus with the schlage one we have you can set it to auto lock after 4 minutes. It's also great if you don't have your keys on you because somebody else was driving. I bet it'd be really useful for people with kids, getting them to memorize a code is easier then making sure they don't lose keys. Your cleaner has a key is a problem. When your cleaner and you have a disagreement and you fire your cleaner, your locks are compromised. In fact, your locks are already compromised because your cleaner may have made copies of your keys and given them to others. Other than that, smart locks are great to check whether or not your doors are locked when you are not at home. You also get notified when the locks are locked and unlocked. Smart locks are obviously not necessary, but neither are your other smart-home appliances like smart smoke detectors, smart doorbells, smart lighting, smart speakers, or smart outlets. If you ever want a recommendation, Schlage Sense seems to be a very good product IMHO. I have two of them, and they haven't yet failed to notify me of being locked/unlocked or failed to lock/unlock via HomeKit or the Schlage app one time. They appear a very solid product and reasonably priced. They use BT LE to communicate with the Apple TV being used as a HomeKit hub. Smart lockers are obviously not necessary, but neither your other smart-home appliances like smart smoke detectors, smart doorbells, smart lighting, smart speakers, or smart outlets. If you ever want a recommendation, Schlage Sense seems to be a very good product IMHO. I have two of them, and they haven't yet failed to notify me of being locked/unlocked or failed to lock/unlock via HomeKit or the Schlage app. They appear a very solid product and reasonably priced. I trust my cleaner more than a smart door lock. AAMOF I trust my cleaner more than one particular child of mine. And you are 100% correct that few of my smart-home devices are necessary (with the possible exception of the smoke/gas detectors), but my smart outlets if they fail to work as designed won't enable someone robbing my home of the things attached to that outlet. That 'ol key just won't hunt no'mo.